The history of Android can be viewed by going through the Android developers numbers and watching in each release how the latest Android build slowly starts to get traction and the older builds start to fade away. We've seen Froyo (Android 2.2) go from a small share of Android models to becoming the dominant build. We watched as Gingerbread replaced Froyo. 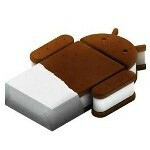 Now, it is Ice Cream Sandwich beginning the journey from new upstart to eventually running on a vast majority of Android phones. It is way too early for Jelly Bean (Android 4.1) to register. 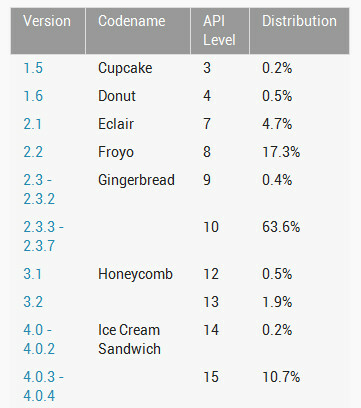 The latest numbers show that between Android 4.0 through 4.0.4, Ice Cream Sandwich is installed on 10.9% of Android devices. That is a far cry from the 64% using Gingerbread, but the launch of the Samsung Galaxy S III alone is going to shake things up in favor of Ice Cream Sandwich. 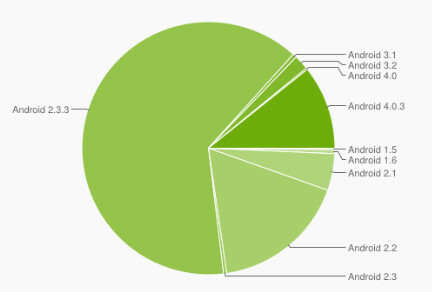 27.3% are still sporting Android 2.2, Froyo. The information, by the way, uses data compiled for the two weeks ended on July 2nd. Believe it or not, 4.7% of Android devices active are running Eclair (Android 2.1) while a combined .7% use devices running Android 1.5 and 1.6. How many Nuvifones are still in use? Well, i wonder is that because all the all the tablets are getting upgraded from Honeycomb to ICS? Just got my daughter the RAZR Maxx two weeks ago, and she got ICS today. She's super impressed with it. It's silky smooth, fast and functional. We'll have to see if it makes the battery even more awesome. Yeah, don't you hate how the notifications bar is so small now? It is so difficult to see the icons taht are up there! Why did they do that? Also, the screen gets darker when it is at 0%! ITS AWESOME!! I wish we could take those extra things off the lockscreen, I sometimes accidently hit them when in a little hurry. And why did they not fix those bugged camera and gallery apps? They are SOOO SLOW! Try pinch-to-zoom in the gallery app and you'll see what I mean. Does anyone know if I could get a different camera app and set it as default? 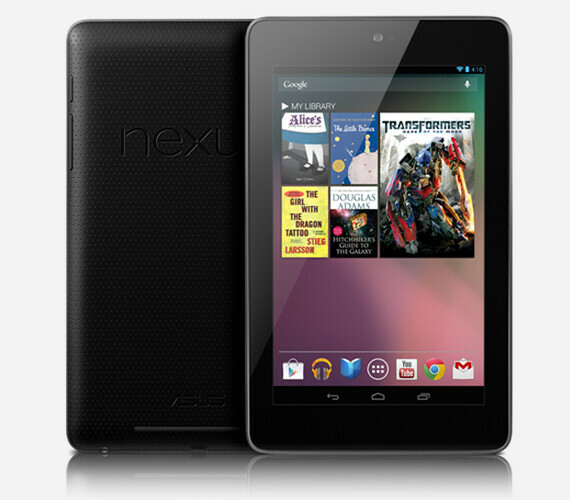 Me too, I have been on Android 4.1 Jelly Bean since a day after Google I/O. Probably because the RAZR family just got ICS 4 days ago. A 3 percent jump. Nice. That's an increase of 12 million units over the course of a month. (multiply 400 million by 0.03) Seems the combination of the Evo launch and the Razr/Razr Maxx (plus a few other devices and tablets) getting ICS has made a bit of a mark. Edit: that's 400,000 units a day getting ICS. Assuming a good percentage of them are sold, I'd say a good chunk of the 1,000,000 activations a day are ICS devices. wonder if this includes the custom ROMs.. It's collected from devices accessing google play in the past 2 weeks so i would say so..
Why not ? It's not like devices running roms won't be able to access the store ? that's part of it but the Razr series would have more of an impact than that. Nah. There are a lot of ICS phones out there now. The EVO LTE, a sequel to one of Sprint's best selling phones ever (so successful that they sold it pretty much up until Christmas last year) has launched, the Galaxy Nexus is on two carriers now (and not selling for 300 f**king bucks anymore) versions of the Galaxy S 2 are getting the update, and the Razr and Razr Maxx are getting it too. Also, the S 3 is launching as we speak, which will lead to a huge jump in sales. We sold the last of our units today. Hoping to get more in by the time I work again on the 4th. Wait, since when was this a discussion about Jellybean's rollout? On the S2: what I meant is that the T-Mobile version has the update, as do some international versions, and the AT&T update is available on Kies (which is, admittedly, f**king stupid). Also, the Razr and Razr Maxx have both had the update rolling out to them, and the update can be triggered manually by anyone who finds out about it. I was just saying that it's reasonable to expect that most of the increase in ICS adoption has to do with the phone updates and launches in the past month, and not necessarily due to tablet updates. Also, I would expect Jellybean adoption to pick up considerably faster than ICS adoption has been. For one, only select models will be getting ICS in the first place (due to hardware limitations; it wasn't until late last year that a good number of phones with the requisite processors and RAM began to be released). Also, ICS is a HELL of an update, with far greater UI changes than most other mobile OSes have ever even attempted. It also adds a ton of features previously exclusive to skins, so the manufacturers (who have to have skins because the carriers are assholes) have had to work on coming up with skins that work well and preserve some unique identity while not killing ICS's native functionality. Since Jellybean offers only a very minor visual refresh and only a handful of (really cool) new features, its adoption should be a relative cakewalk, especially as more phones with ICS (or that are ICS capable) are released. Hallelujah. He's returned. It's a real shame that even though Android devices don't get updates as often, iOS 6 still isn't as good as Android 2.0 Eclair. Go play with your little iPhone, silly child. Welcome back to the ifan clubs.... Gallitoking Taco Good2great The legend Strickercho ????????? ???????? ?